Coco, the Couture Cat: Thankful Thursday, #BlogPaws Style! 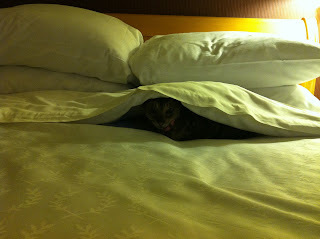 This was Coco Tuesday, building up her energy stores while I pack for our adventure! Here's Coco in her new Red Furrari, being a very patient cat while we spent 12 hours in the airport due to delays! Yes, we were there at the crack of dawn! Well, I used a curse word on Facebook yesterday, describing our travel day yesterday! I made me laugh to hear friends say later that they knew I was upset when I said 'We had a rough day' and used an expletive that some have never used in public! A minor disaster was averted when I found my lost phone. I had tossed it in Coco's Little Red Furrari as we were preparing to board the plane, and had visions of having to find a Verizon store today and finally 'upgrading' my old iPhone...but I found it while unpacking last night...Oh, also Thank Cod that my luggage didn't get lost, too! Coco was a real travel pro and as I didn't think it necessary to bring along her small travel litter box and litter..she had to 'hold it' all day and that concerned me, but the minute we got into our room last night, she used the facilities and I am sure, felt much better. We are sorry we missed the Ice Cream Social (but Coco wore her Ice Cream dress last night as we went out to find friends (which we did--ferret, doggie and kitty friends) and had a much needed Long Island Iced Tea while lots of hugs and sweet sentiments where spread around! My phone was dead, so no pix of those meet 'n greets! I love the new 'Green' Sched.org app and getting notification of what is on our agenda for the day! Today is pretty relaxed, getting to know the lay of the land and working on getting our room ready for visitors (who will be treated to Peach Bellinis (have to get the Prosecco still) and sweets. 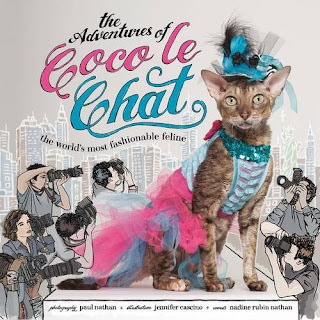 I brought copies of the book featuring The Adventures Coco, Coco LeChat, the World's Most Fashionable Feline which Coco will be pawtographing for people who would like to get their own copy of this sweet book! 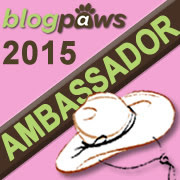 Love being here and Love being a BlogPaws Ambassador! I loooove the cover of your book. Beautiful. My human and I are SO glad you made it in finally! 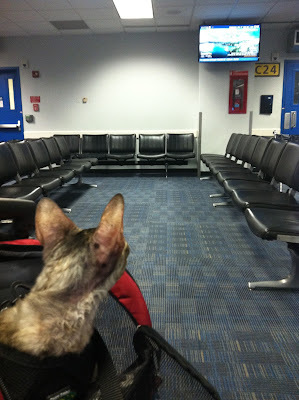 We felt so bad for you and Coco having to wait in the airport all that time. Hahaha I totally saw the expletive and thought it was very fitting! You had a VERY rough day! I'm so happy I got to meet you and Coco today!!!! You two are so incredibly fabulous! You did such a great job as ambassador, helping people feel welcome and included. CoCo is the cutest. My only regret is that I wish we would have had time to chat! I love every single one of her outfits! I loved meeting Coco in person! Thank you for sharing her with all of us! I am so happy I was able to meet you and Coco. 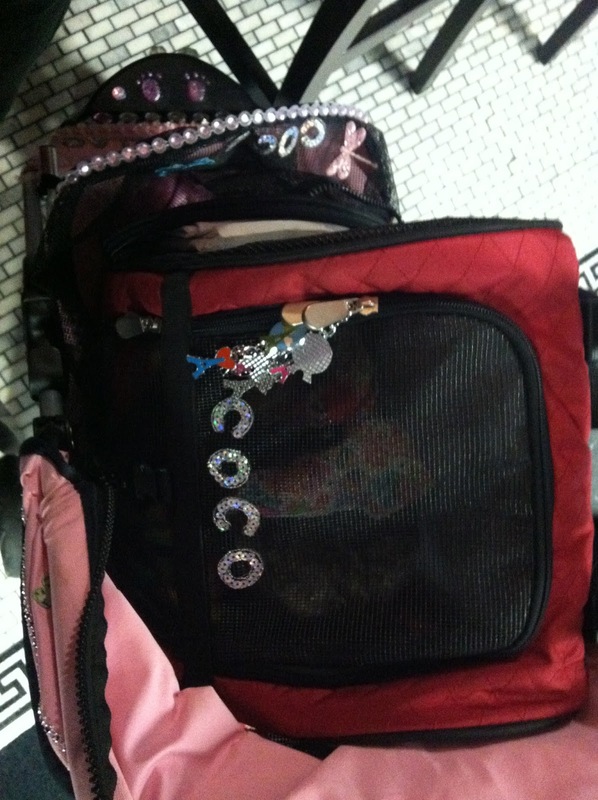 Coco looked exquisite in her outfits and in her pink Catillac. I am so sorry to hear you had a rough time at the airport coming in but it looked like you were having a blast when we met! Wow, we didn't realize you had such a rough trip in. 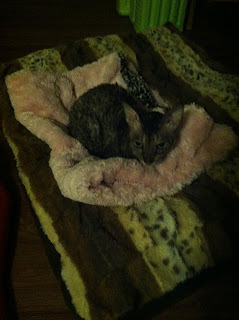 Mom would never have guessed -- Coco was such a laid back kitty! 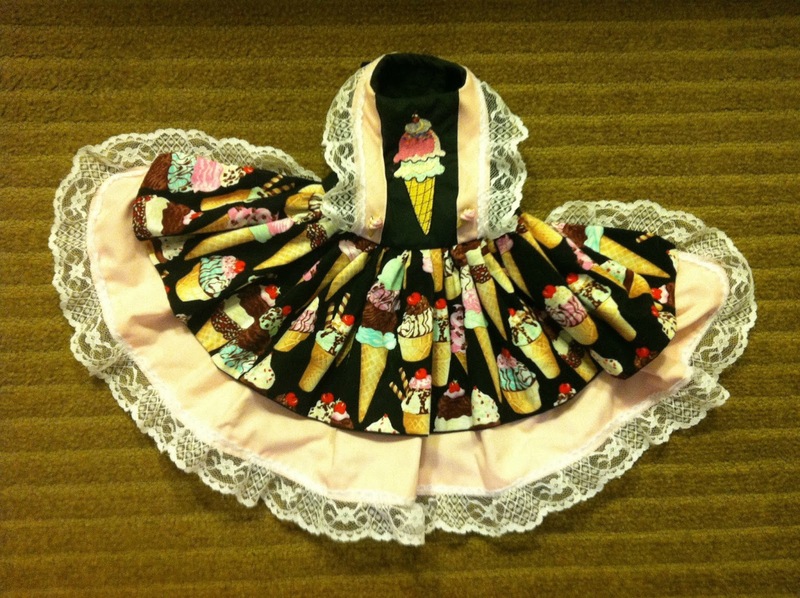 Coco you have the coolest wardrobe. Had no idea you were already blogging since Deb Barnes and I weren't tagged. 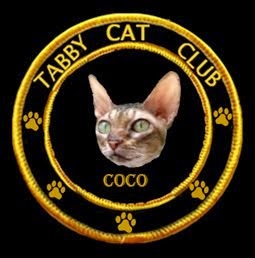 Loved sharing a taxi with you and Coco but the rest of the time was a blur. Lost my cell, laptop and travel delay (just got home). 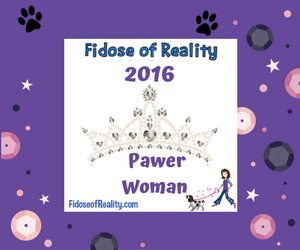 Would love a guest post from you for the CWA blog. 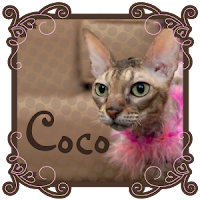 I have to tell you, Coco is beautiful, and is one of the most vivid memories I took away from BlogPaws. Gorgeous!